This is the first image captured in space by the European-Japanese BepiColombo mission to Mercury. It was taken by a monitoring camera on BepiColombo’s Mercury Transfer Module (MTM) on Oct. 20, 2018, the day after the mission launched on its long voyage to Mercury. The photo shows one of BepiColombo’s extended solar arrays (right) and an insulation-wrapped sun sensor on the MTM (left). A newly launched mission to Mercury has beamed home its first photo from space. 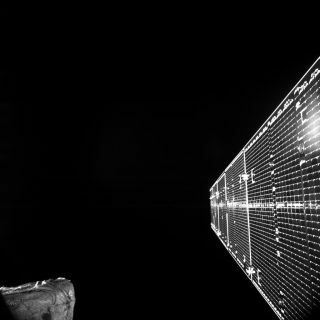 The European-Japanese BepiColombo mission captured a selfie showing an extended solar array and an insulation-wrapped sun sensor on Saturday (Oct. 20), a day after lifting off from Kourou, French Guiana. And this cruise will be very long indeed. BepiColombo is scheduled to slip into orbit around Mercury in December 2025, after nine different planetary flybys — one of Earth, two of Venus and six of Mercury. This complicated trajectory is a consequence of Mercury's high orbital speed and proximity to the sun; Mercury-bound spacecraft have to thread a needle to reach the planet and avoid getting sucked in by our star's powerful gravity. Once at Mercury, the two orbiters will separate and go their own ways. The diverse data gathered by the duo will paint a comprehensive picture of the rocky planet, shedding light on its composition, structure, magnetic field, formation and evolution, among other characteristics, mission officials have said. This diagram shows the spacecraft that comprise the BepiColombo Mercury mission, as well as the location of the monitoring camera that took the mission’s first photo — the selfie seen at left, which was captured on Oct. 20, 2018, the day after the mission launched. The historic first photo was snapped by one of the three black-and-white monitoring cameras aboard the MTM. If all goes according to plan, the other two cameras will be activated on Sunday (Oct. 21) and take images of the MPO's deployed medium-gain and high-gain antennas, ESA officials said. "The monitoring cameras will be used on various occasions during the cruise phase, notably during the flybys of Earth, Venus and Mercury," ESA officials wrote in a description of the newly released photo. "While the MPO is equipped with a high-resolution scientific camera, this can only be operated after separating from the MTM upon arrival at Mercury in late 2025 because, like several of the 11 instrument suites, it is located on the side of the spacecraft fixed to the MTM during cruise," they added. Mike Wall's book about the search for alien life, "Out There," will be published on Nov. 13 by Grand Central Publishing. Follow him on Twitter @michaeldwall. Follow us @Spacedotcom or Facebook. Originally published on Space.com.